UPDATE: This museum is no more. 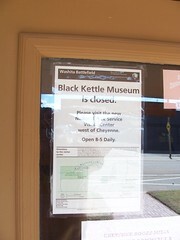 They have moved everything to the new Washita Battlefield National Historic Site Visitors Center to the west of town. 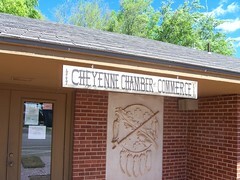 The building is now the Cheyenne Chamber of Commerce. Museum focuses on the Cheyenne people and the attack of George Armstrong Custer on Cheyenne Chief Black Kettle's village November 27, 1868. The museum serves at present as the interpretive center for the Washita Battlefield National Historic Site. The museum includes Cheyenne history, Oklahoma history, art and artifacts, area information, with a gift shop featureing books, children's books, dolls, stuffed animals, and Native American art. Intersection of U.S. 283 (L.L. Males Ave.) and Highway 47. Next to Roger Mills County Courthouse.